Oh, cripes! Have you been down to Plymouth see the Church Basement Ladies? Let me tell ya, it's real fun and it's real, real cute. Oh, those gals are funny! Greta Grosch, Tim Drake, and Janet Paone. Photo by Paul Nixdorf. And this time around, it's not just the gals ... there's men, too. "A Lutheran take on the classical 'hero' journey, Rise Up, O Men is the story of men (and women) who become larger than themselves; it's the story of a group of farmers and John Deere dealers, and church basement ladies, who rise up to the requirement of heroism in order to help their community and its future." But as with all of the Church Basement Ladies shows, it's more about the delightful, gentle humor poking fun at Midwestern quirks and institutions. In fact, the the Church Basement Ladies themselves are practically a Minnesota institution. 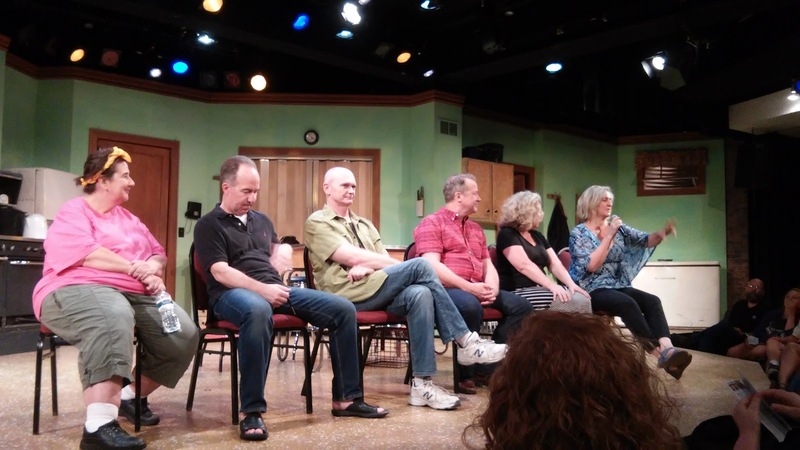 The stories in the basement all began in 2005, when Curt Wollan commissioned Jim Stowell and Jessica Zuehlke to adapt the book Growing Up Lutheran (by Janice Letnes Martin and Suzanne Nelson) into a play with music and lyrics by Drew Jansen. Rise Up, O Men is the sixth of the Church Basement Ladies shows. Written by Greta Grosch, with music and lyrics by Dennis Curley (who I remember fondly from Theater Latte Da's Beautiful Thing), it features additional material by Graydon Royce. You know, Graydon Royce, our retiring local theater critic. Intriguing! The show is set in 1964, and features the original Church Basement Ladies: Greta Grosch as Mavis Gilmerson, Janet Paone as Vivian, aka "the widow Snustad", and Dorian Chalmers as Karin Engelson. I'd be perfectly happy to spend a nice long funeral lunch in the kitchen with these ladies--they are hilarious, and they do sing so beautifully. Greta Grosch plays Mavis with vigor as a stalwart and cheerful soul who doesn't mind rolling up her sleeves and putting on a tool belt. One could imagine Dorian Chalmers' Karin as the pretty, popular girl who never really left that persona behind. And Janet Paone is an absolute delight to watch. Vivian is the queen bee of the church kitchen, and she knows her power. But she wields her power as often to tease as to scold, and her sly smile lets us know she is enjoying the company her friends provide. Paone is also a singer with serious chops, and to hear her glorious soprano ringing through the basement is an unexpected joy. But wait, there's more: Jeff March plays husband of Karen, Elroy Engelson, Tim Drake plays Pastor, and Peter Colborn plays handyman Carl. The guys also play other roles, but it feels a bit spoilery to tell you which ones. March has a lovely voice, and a wonderful gravity, and Drake plays the slightly neurotic Pastor to perfection. As for Peter Colborn, he plays two roles so differently that I was actually thinking there was an actor in the program that I missed; that there couldn't be an another actor his exact height. It sounds daffy, but it's true and amazing. The songs are at times cute and funny, and at times really moving, such as the standout tune: "And Now These Three" which features the three Ladies singing together so beautifully that you don't want them to stop. Oh, and the set was wonderful--very familiar to anyone who's spent any time in a church kitchen. The set was perfectly period-appropriate, although we heard that an audience member had found something on the stage that was from 1965, not 1964.Try as we might, we could not track it down. The costumes were also great--why did housedresses ever go out of style? They look very comfortable. Plus, aprons. More aprons, I say! The Plymouth Playhouse hosted the Twin Cities Theater Bloggers on August 19th, which included our friends from local theater blogs Artfully Engaging, Play Off the Page, and Compendium. 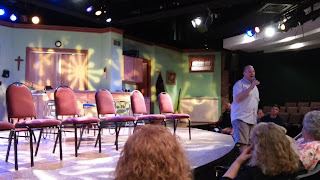 After the show, there was a delightful post-show discussion, and the charming Dennis Curley warmed up the crowd. It was a little surprising to see the actors come out on stage. I kept thinking, but where is the cast? Who are these attractive, modern-looking people? Not an apron or collar in sight! 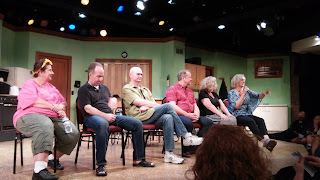 The post-play discussion itself was very interesting, with lots of fascinating points about what it's like to return to these characters, and the process of putting together a brand-new show. Lots of engaged and enthusiastic audience members, and Dennis Curley and Greta Grosch moderated the discussion beautifully and kept things moving. Thanks much to the Plymouth Playhouse for hosting us! We had a lovely time! I'm a little surprised we weren't sent home with some leftover bars, but we didn't want to be any bother. Wink! Read more about this fun event at Artfully Engaging, Play Off the Page and Compendium! Rise Up, O Men plays through November 13 at the Plymouth Playhouse and will return after the holidays. 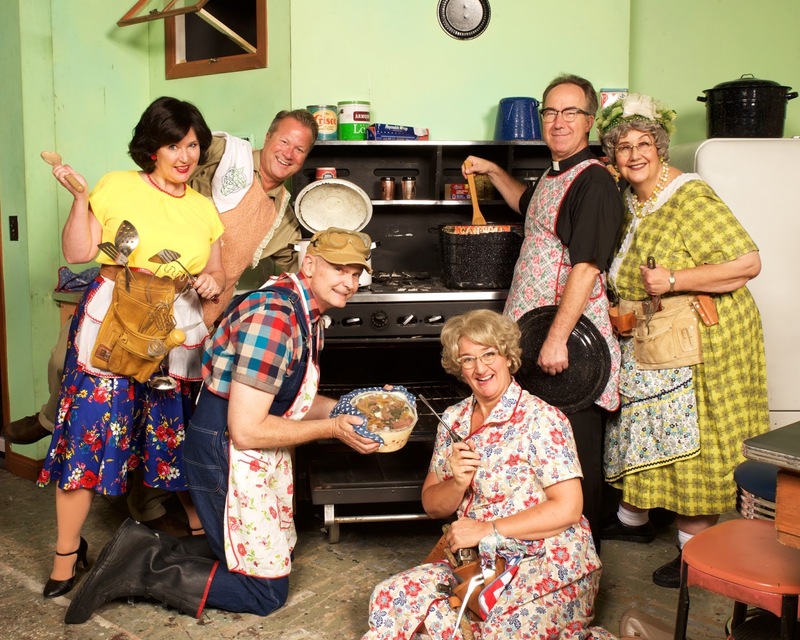 From November 16-December 31, the Christmas-themed Church Basement Ladies show, Away in the Basement, takes over the stage.